It has come to my attention that there are different ways of loading an URL into a string and processing the content using either regExp or InStr. There is an efficient command in Unix/Linux called wget that seems far more successful than the RB get -command. // Will give up after maximumIterations interations. I keep getting this Real Studio error when running this code! The code as you write it wont compile... so, I tried to fix it! I have RS 2012 v1, and after next pay-day I will renew! Maybe you have a later version? I don't know why that would be a fatal error, but you can replace "kDefaultMaximumIterations" with simply "5" (or some other number of your choosing). That controls how many redirects the code will follow before it gives up. 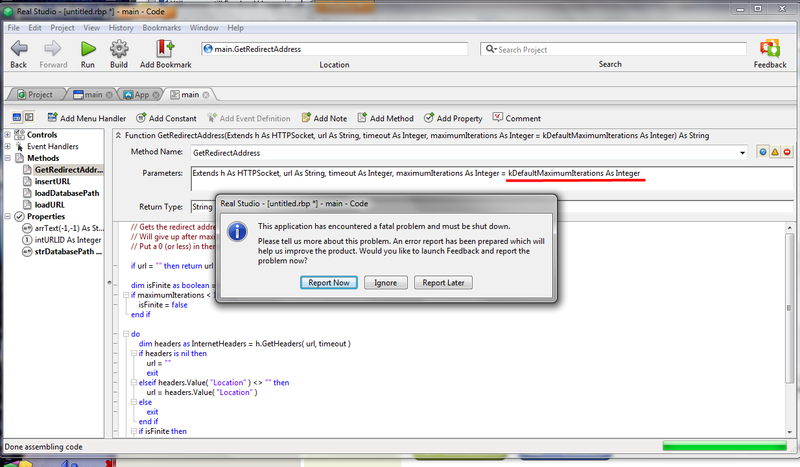 However, I get all kinds of errors when trying to compile... I need to examine your code really carefully and maybe I can rewrite it. It's really educating when copy/paste doesn't work! I like challenges! I don't complain! I'll look into this tomorrow!! Too many "as integer" in there. That might be the problem. Also, any method using Extends must be defined in a Module. wget creates a http get request, downloads html page source, parses it then downloads resources linked within the page, using further http get requests. wget is a web browser in it's own right. httpsocket.get creates a single http get request, which downloads the page source. If you want to download the resources linked within the page, you will need to parse the html page source and issue further httpsocket.get requests yourself.